Are you looking to buy the perfect lifestyle pickup? Then why not start your search with the 2019 Honda Ridgeline RTL-E and the 2019 Toyota Tacoma. It’s no surprise that these are two of the hottest trucks on the market right now. But how do you know which is best for your commutes? We’re here to help with that question by offering you a quick comparison of the two pickups. So give this guide a double check during your shopping. 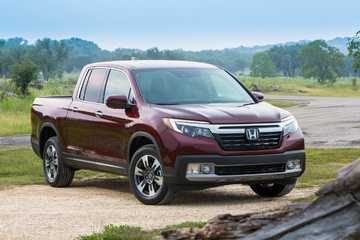 For the 2019 Honda Ridgeline RTL-E, you’ll get quite the capable 3.5L V6. And with this motor comes 280 hp—more than enough for passing any slow drivers on the highway or hauling a heavy load. But what’s really impressive here is the 25 highway mpg the engine provides. * No doubt you’ll find quite the savings at the pumps with that fuel economy. As far as the brakes go, you’ll get disc brakes. With these, you’ll effortlessly come to a complete stop in any situation. And to help you stay safe while doing so, you’ll even get a rear stabilizer bar thrown in as a standard feature. Toyota offers a comparable engine with a 3.5L V6. Even the power is quite similar at 278 hp. However, the fuel economy ranks in at 22 highway mpg. ** Nonetheless, it’s a decent figure for your daily commutes. You’ll also get drum brakes to help you come to a complete stop anytime you need. Step inside the 2019 Honda Ridgeline RTL-E and you’ll find plenty of fun and convenience waiting for you. For starters, an illuminated vanity mirror comes standard. It’s the perfect accessory for your passengers to touch up hair, makeup, or anything else during any time of the day. Also, keep your passengers comfortable with rear seat AC and heating. And speaking of the rear seats, don’t forget that seatback storage comes standard. So you’ll have plenty of space to store any goods for work or home. As far as the front seat goes, you’ll get a standard memory power seat. And to make matters all the better, those front seats are heated. Thus, you’re ready to drive this pickup during any season of the year. Inside the Toyota Tacoma, you’ll get your standard AM/FM stereo. Also, the base model comes with an adjustable front seat. During the wet seasons, you can keep your pickup clean with the optional floor mats. Are you ready to buy a new lifestyle pickup? Then visit JL Freed Honda, where we have a Honda Ridgeline RTL-E waiting for you. For more information on when to stop by, check out JL Freed Honda’s hours. * 19 city/26 highway/22 combined mpg rating for 2WD models. 18 city/25 highway/21 combined mpg rating for AWD models. Based on 2019 EPA mileage ratings. Use for comparison purposes only. Your mileage will vary depending on how you drive and maintain your vehicle, driving conditions and other factors.